6ty˚ has been consistently involved in ongoing projects at Marist Regional College over the past 20 years including the Harcombe Centre, Performing Arts Centre, Administration Upgrade, Chanel Centre & the most recently completed McAuley Centre. 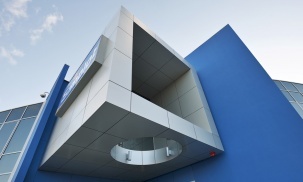 The McAuley centre is modeled on a mirrored version of the original design for the Chanel Centre. An image of the elderly ladies hands resting on the bible was the genesis of the new building and this underlying design philosophy, that is the hands of prayer, became the spine or backbone for the new building. The hands of prayer mean many things to many people but upon reflection we believe the joined hands could offer sanctuary, love, knowledge, truth, honesty, reality, energy, understanding, protection to name a few in the name of God, all of which is embodied in the fabric and experience of the new middle school learning centre. The heart of the new learning centre is the main breakout space which provides an enclosed but light and vibrant space in which the students feel comfortable to ‘hang out’. The area was designed as a back drop for the students to change as they see fit and thus becoming a space in which they can express themselves. 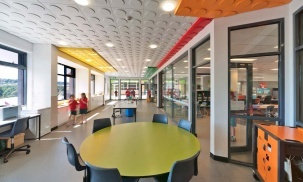 By taking the attitude that the occupants will have ownership over this space creates a vibrant ever changing atmosphere of self expression that allows the students to explore their inner feelings and their place in the school community. Natural light filters into the space from large highlight windows, enhancing the ambiance of the area. The building also incorporates six GLA’s (General Learning Areas), a discovery centre, cafe, amenities, staff offices & meeting rooms. The classrooms are more formally arranged around the central breakout area and arranged in clusters of 2 classrooms to stimulate the working relationship between the partnered spaces. Each learning area has been equipped with storage facilities along with individual break out learning areas set up as quiet areas for small groups. The classrooms all have access and a strong visual connection to the main central breakout area whilst the discovery centre opens up completely to this space via large bifold doors allowing the larger year community to meet as one. A strong feature in the connecting student café is a glass splashback custom designed by 6ty˚. This splashback was so positioned to evoke reflection whilst students are in the common space and incorporates catholic values as well as ideas relating to food, music, science, maths and images of the good things in life. Externally, the colour and material palette was selected & carefully positioned to reinforce the central design theme and incorporates vibrant colours contrasting with textured concrete block feature walls. A large deck takes full advantage of sweeping views as a backdrop for breakout activities.